I love Salisbury Steaks and have been making this recipe regularly for dinner for almost a decade. 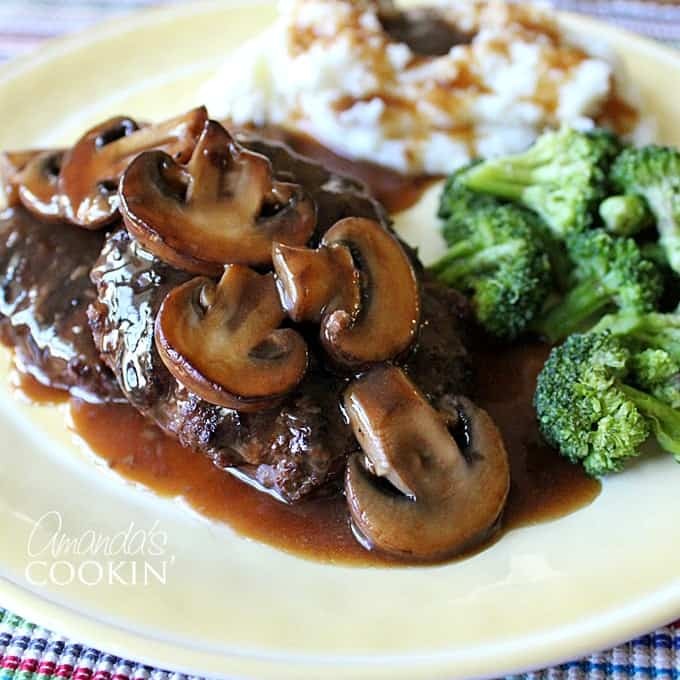 I’ve even made a version that replaces some of the meat with Portobello mushrooms! I’ll admit that when I was a kid my dad used to feed us On-Cor frozen dinners, and Salisbury Steaks were my favorite. 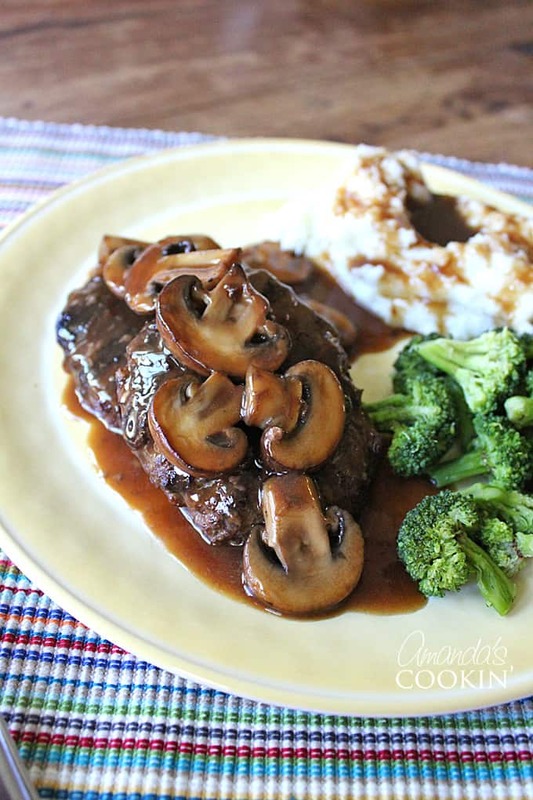 I’ve tried a few different Salisbury steak recipes, all of which I didn’t care for until I found this one years ago. In all scenarios, I cover them in gravy first then cook. I’ll give you instructions below for all three methods, but the Crockpot definitely makes the most tender Salisbury steak. Place grilled patties into a 13x9x2 baking pan and cover with gravy. Cover the pan tightly with aluminum foil. Bake in a preheated 375 F oven for 25 minutes. After removing from the oven, allow to rest for ten minutes before removing the foil cover and serving. Place grilled patties in a large skillet and cover with gravy. Bring to a boil then reduce heat, cover and simmer for 25 minutes. Turn off heat and allow to rest for ten minutes before removing the cover and serving. Place grilled patties in the slow cooker crock and cover with gravy. Cook on low for 6-8 hours. Remove patties from gravy, tent with foil and set aside. Spoon off any excess fat from gravy. Turn slow cooker on high to thicken gravy if needed. 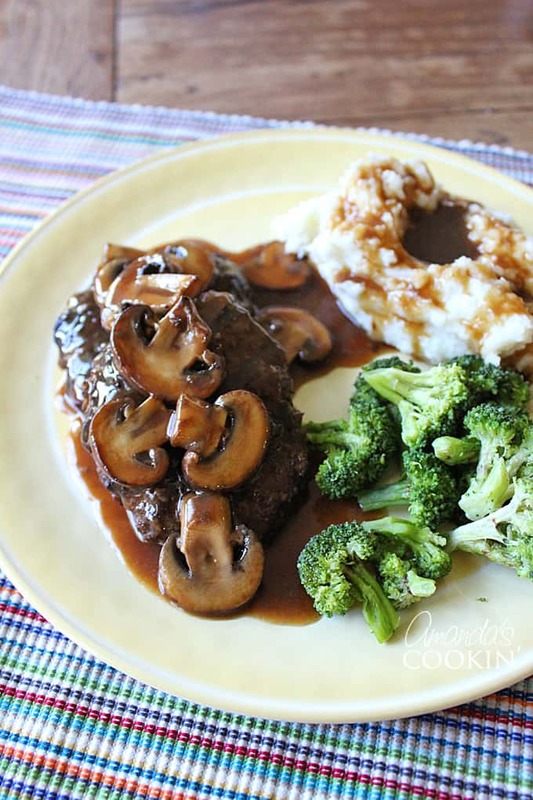 You can add your mushrooms to any of the pans and allow them to cook in the gravy. I prefer that my mushrooms not be completely soft, so I saute them in a skillet and add them to the gravy just before serving. In the oven, cover pan tightly with aluminum foil. Bake in 375 F oven for 25 minutes. On the stovetop, simmer for 25 minutes. In the slow cooker, cool on low for 6-8 hours. 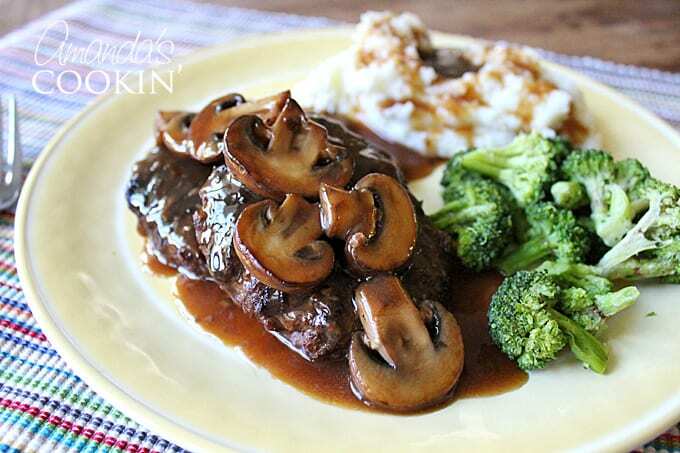 Serve your delicious Salisbury steaks with gravy, mashed potatoes, and broccoli or Slow Cooker Balsamic Carrots. Mmmmmmm! 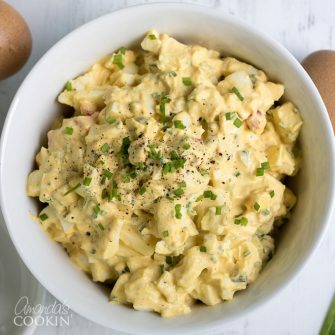 If you love using your slow cooker and are always looking for recipes, try our crockpot mac and cheese! One of my family and I’s favorite casserole dishes is this southwest ground beef casserole. It has tons of tasty flavors and is so filling. Perfect for a weeknight meal. You don’t want to miss the best meatloaf recipe ever, I swear by this one! This Cheesy Ground Beef Enchilada Chili from Oh Sweet Basil sounds delicious! These Ground Beef Gyro Meatballs from Kalyn’s Kitchen are calling my name, definitely trying these. I just found these Salisbury Steak Meatballs and thought it was totally genius! 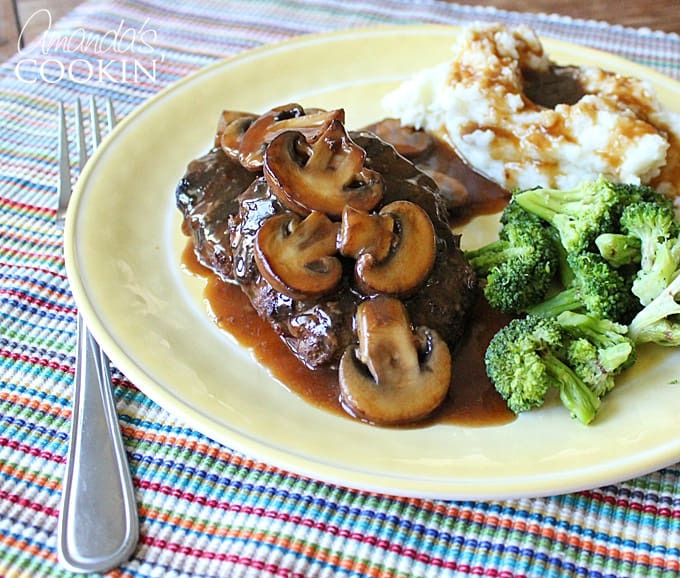 If you loved Encor salisbury steaks as a child, you must try this homemade version! In a large bowl, mix together ground beef, egg white, onion, cracker crumbs, milk, salt and pepper. Use your hands to be sure everything is mixed evenly. Form 10 oval shaped patties from the meat mixture. Brown both sides of patties on the grill, just enough to get those fabulous grill marks on both sides. You can also brown them in a skillet if you prefer. Place grilled patties in a large skillet and over with gravy. Bring to a boil then reduce heat, cover and simmer for 25 minutes. Turn off heat and allow to rest for ten minutes before removing the cover and serving. COOK TIMES reflect oven and stovetop methods. NOTE: Nutritional information does not include gravy. Yum, that looks delicious. I haven’t had Salisbury Steak for ages but always liked it. Thanks for the shout-out for my Ground Beef Gyro Meatballs too. I had a really bad week at work (I am a nurse in a correctional facility) and the last thing I wanted to do on a Friday night was cook. Lo and behold, when I finally made it home and opened the door I was greeted by a beautifully set table, a glass of my favorite merlot and the wonderful savory aroma of salisbury steaks bubbling away in a pan of deep brown gravy. Yes, it was my ever-so-thoughtful husband at work!! He’s a retired “educator” with the time and the inclination to treat me like a queen. Lucky me! Anyway, the salisbury steaks were AWESOME and just the kind of comfort food I was craving. My husband made extra, which we froze in the gravy. THANK YOU for helping me get over a stressful week. When I was a kid (let’s see, that was about 60 years ago … LOL), I also liked salisbury steaks, which was one of the things that our maid could do really well. Haven’t had any in a long time, but your post prompted me to ask my lovely wife, Doctor E, to give it a try. She will probably use ground bison, instead of beef, but I can hardly wait to re-awaken what’s left of my childhood taste buds. Thanks for the neat post. My son would’ve come right over to eat dinner with you if we lived nearby! ;) This has always been one of his favorite meals. I had to laugh because my sister and I ate our share of Swanson’s salisbury steak growing up, too! lol! Admittedly, I’ve tried several recipes before I found and settled on this one. My husband didn’t like the first two or three I tried but this one was a keeper!